Open the box and unleash the beast with the Never Summer Pandora Snowboard. Specifically made for the park and pipe, the Pandora offers a soft flex that allows perfect butters while the Full Length Wood Core offers superior pop. The Durasurf Sintered 4501 Base, a Never Summer exclusive, will help you keep your speed up throughout the park so you can continue to go bigger and better. 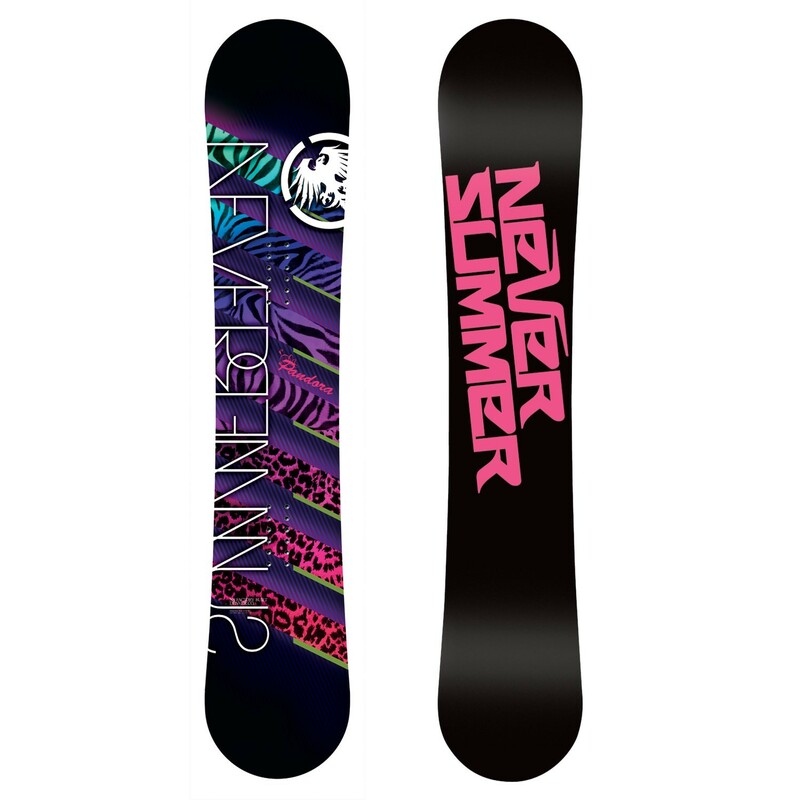 Take the park by storm this year with the Never Summer Pandora Snowboard. R.C. – The original Rocker & Camber construction blends a custom rocker profile with separate camber areas at each end of the board, providing unmatched power and snap out of turns. This also provides better board tracking for high speed stability and massive ollies. Vario Power Grip – Multi-radius sidecut adds increased edgehold precisely where it's needed most, from 2 inches outside of each binding and inward toward the center of the board, providing added control and response in any conditions (Sidecut Radius numbers are an average). Full Length Wood Core – Combining both light and hard wood laminated together to create a lightweight, yet durable, board that still provides plenty of pop. Bi-Lite Fiberglass – Combining the strength characteristics of STS ADVANCED fiberglass with an ultra light glass fiber matrix, this delivers incredible freestyle and freeride performance without sacrificing durability. EDS Damping System – Delivering increased edgehold and high speed stability without compromising freestyle performance. Sintered P-Tex Sidewall – Unlike conventional ABS sidewalls that have a tendency to crack in colder temperatures, the Sintered P-Tex Sidewall maintains it's integrity at any temperature. Durasurf Sintered 4501 Base – Crown Plastics has been the industry leader in sintered materials for over 36 years and has created the Durasurf Sintered 4501 Base exclusively for Never Summer. This new high density base is extremely fast and will provide unmatched performance and durability. 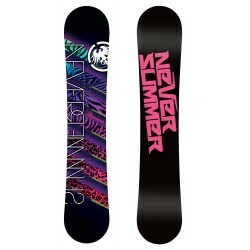 Never Summer snowboards offer 2x4 insert patterns. Angegebene Versandkosten gelten nur innerhalb Deutschland, auch nicht für Versand auf Inseln und ins Ausland !! Bitte Snowboards bei Anlieferung sofort auf Schäden kontrollieren und gegebenenfalls evtl. Schäden sofort beim Transportunternehmen anzeigen. Leichter Flugrost auf den Stahlkanten der Boards ist kein Qualitätsmangel, entsteht leider bei hoher Luftfeuchtigkeit. Bitte beachten, das bei Snowboards die schon etwas länger stehen, sich manchmal etwas Flugrost auf Grund der vorhandenen Luftfeuchtiggkeit an den Kanten bildet !